This sculpture maintains a balance between stasis and transition: it addresses those uncertain times when we stand at the threshold of choice between the comforts of the old and familiar, and the adventures of the new and unknown. The duality of time is held in a tower clad with black walnut and reclaimed 100 year-old English boxwood smoothed with an interior of modern sapphire enamel. 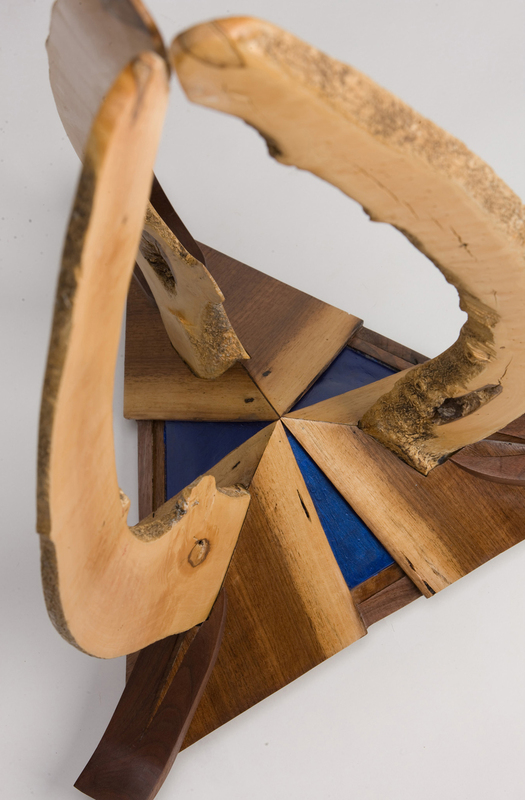 The base is shaped on the strength of an equilateral triangle, with three strong vertical sliced cuts of black walnut. The natural edged cream-colored sapwood contrasts the darker depths of an azure center, pushing upward towards the pyramid, yielding the intersecting circles. The sliced boxwood branches gently touch, creating an opened but contained clear space, a moment where time is both maintained and sustained. An echo of a flame is suggested within the branches embracing the space between them, implying a balance of darkness and lightness. The tower transcends strength with a graceful circle of the optimism and achievements of the future and the past.